Now that there are only eight contestants left in the Fall Classic, the tension ramps up considerably. The Fall Classic preliminaries have ended, and the finals have now begun. Eight of the best prospective chefs in the Totsuki Culinary Academy now prepare to do battle over a range of dish types in intense duels for supremacy. The first pairing, Soma Yukihira versus Alice Nakiri, is in progress as Soma faces Alice’s wealth of chemical knowledge, with Megumi up right after. Food Wars! is a series that will appeal to an interesting mix of audiences, both the shounen battle fans and those with an interest in cooking, as the series combines both in its storytelling. The Fall Classic finals have finally begun, and Food Wars’ ninth volume picks right back up from the previous volume as Soma and Alice Nakiri are competing in the first match. As the presentation of their food goes over with the judges (with the usual explosions of clothes), the narrative explores Alice’s past as a member of the off-branch of the Nakiri family and her emotional turmoil as Soma is shown to be valid competition for her despite her self-assurance. The face-off between the two characters, in this manner, was similar to many others from the past as the cooking always brings out the characteristics of the chef. However, the topic of the challenge, bento lunches, was actually the most interesting portion of the competition not just because of the unorthodoxy of the idea but because of the cooking concepts it brings about. While the food is always amazing in detail and presentation, the concept of fighting not just for competency but the match the topic of the battle is interesting as it isn’t just about making the best food but about making the best bento. With the idea of a boxed lunch comes different ways of presentation, and the depth of the culinary concepts somehow continues to be interesting despite the readers having already gone through so many face-offs. I always find this depth one of the best parts of the series, and once again Food Wars manages to pull it off in this volume. Exploring characters and exhibiting deep culinary knowledge wasn’t my favorite part of the volume, even if it was excellent. The second battle of the volume, Megumi versus Ryo Kurokiba (Alice’s ‘assistant’), was actually my favorite part because it was slightly different from the others in terms of character development. Food Wars really likes to explore characters’ pasts when they compete, but although this adds to individuals, there hasn’t been much marked development in terms of characters actually changing over the course of the series. Every once and a while someone might remark “you’ve improved so much!”, but I haven’t actually felt that with any of the characters until I saw Megumi this volume. She’s become significantly different since the days of panicking and almost failing out of the school, and now faces the incredibly scary Kurokiba without flinching. A manga about cooking is hardly the place where you would expect characters to progress substantially, but Food Wars manages to pull it off, which really helps keep things fresh for me as I read it. Megumi’s development is really accented by the illustrations. I’ve said it before, but I’ll say it again: artist Shun Saeki’s illustrations are some of the best in the business. He captures the emotions of his characters beautifully and clearly, which really sells the characters’ reactions and development for me in a way that wouldn’t be possible otherwise. There doesn’t ever seem to be points where quality drops either, which is astounding considering the fast-paced release schedule the series has in Japan (there has literally been a new volume over there every two months for three years now). If there is one thing that might be slightly frustrating for readers in Food Wars, it would definitely be the continual cliffhangers. If you were hoping that this volume wouldn’t end in the middle of a battle like the last few have, think again. Fortunately, however, this is still offset a bit by the storytelling of the battles. The best mystery stories are the ones where you can take the evidence from the story as it progresses and piece together what happened by yourself, and although Food Wars isn’t a mystery series, the same can be done in its competitions. As the judges react to the contestants’ dishes, it’s perfectly possible to guess with accuracy who will win the face-off, and so even though the books often end right before judging, the narrative gives you a bit to work with in terms of what will happen next, which lessens the annoyance for me at the end of the volume. 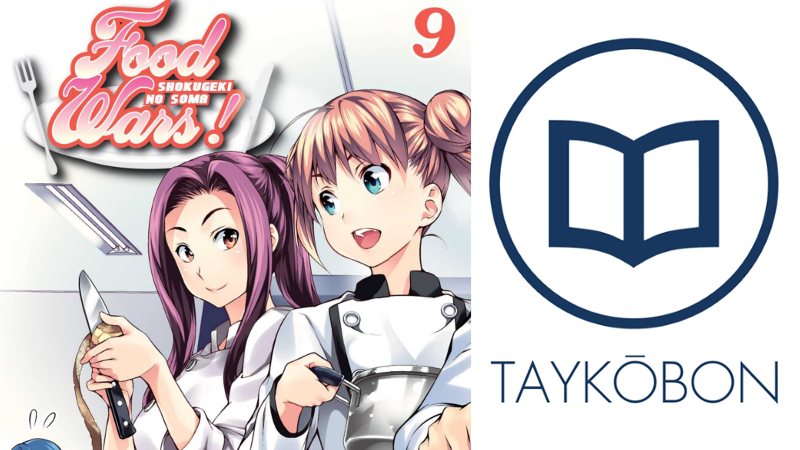 Food Wars continues its culinary battles in its ninth volume with the same elegance it has displayed in previous entries in the series. I wouldn’t say that this volume in particular somehow knocks others out of the water, but it maintains the appeal of exploring the art of making food through its intensity and depth through new facets of cooking and its characters. If you’re wondering if you should buy this next book in the series, my answer is most definitely a yes, you won’t be disappointed with the developments of this ninth volume. Food Wars! : Shokugeki No Soma Volume 9 was published by Viz Media on December 1st, 2015. Authored by Yuto Tsukudo and drawn by Shun Saeki, the series adaption began in 2012 and is still ongoing in Shueisha’s Weekly Shonen Jump magazine. Volume 10 will be published in English on February 2nd, 2016, and an anime adaption produced by J.C. Staff aired from the Spring 2015 to Summer 2015 season. Akira Hayama is a master of spices, so Soma better have a good plan if he wants to challenge him!